If you saw yesterday’s post about Scandi style bloggers you will have seen I’m slightly obsessed with the laidback Scandinavian fashion. I was more than a little excited about the prospect of a shopping spree in Gothenburg! The style is chic, it’s classy and it’s just so easy for travel. As I’m 6 months pregnant I didn’t buy too much but I loved wandering around the city and making a mental note of all the things I want to buy once Baby is born. 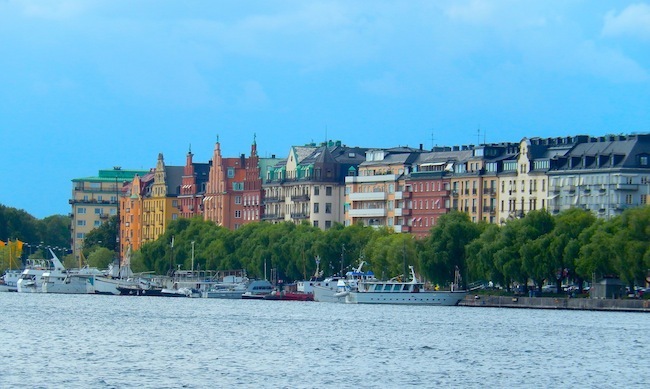 The lovely peeps at Goteborg.com put together a design and shopping walking tour for me. 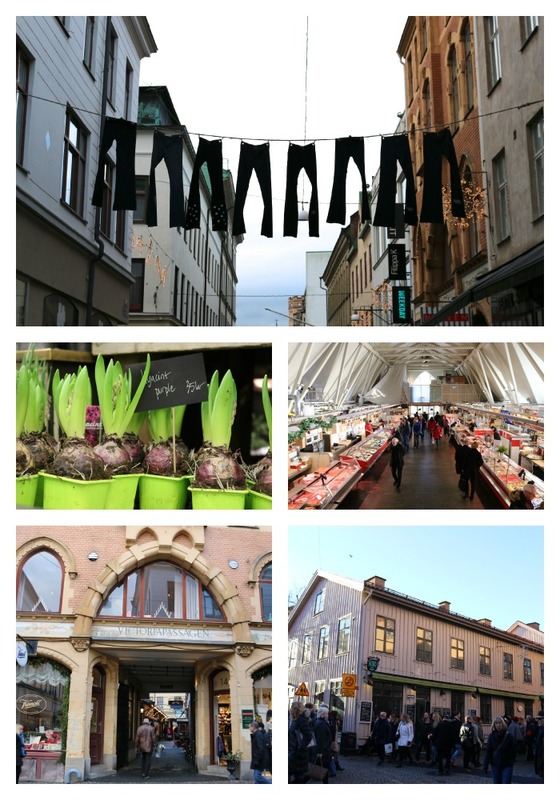 Gothenburg city center is pretty small so this walking tour is really easy to follow. If you spent a couple of minutes in each shop and didn’t stop to eat or drink this shopping walking tour would take about an hour. We did it in about 4-hours because we stopped for lunch and there were Christmas markets on. Turn left onto Södra Larmgatan and straight ahead you’ll see the Saluhallen Market Hall. Pop inside and you’ll find lots of tasty food samples on offer. 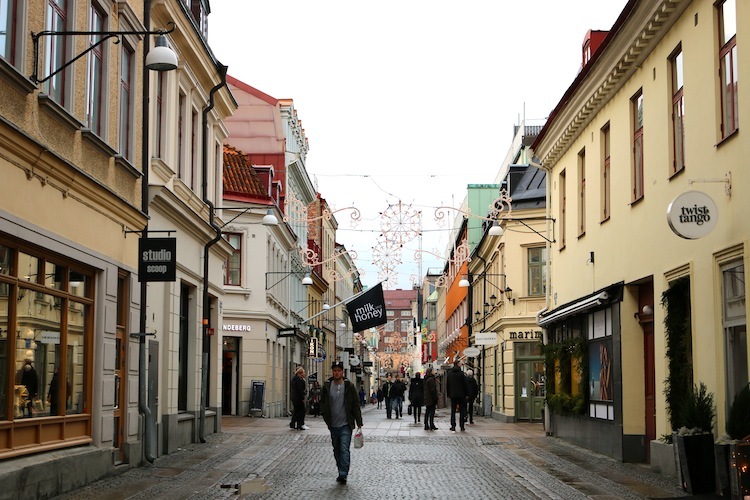 Continue along Södra Larmgatan where you’ll find STUK Manufaktur, well known for their jeans and stylish knits. Warning: You’ll probably want to buy everything in the store but pace yourself, there’s a lot more shopping to be done! Other shops nearby include Monki and Sally Jones. Sally Jones looks a bit dull from the outside but it’s a treasure trove inside so don’t skip it! Turn right and walk through the quaint Victoria Passage where you’ll find some smaller boutique stores. Continue to the left on Vallgatan and you’ll come to Nudie, a local men’s jeans brand. Next door is the Swedish design shop, Krypton Form and I pretty much fell in love with every single item in here. Opposite, you’ll find Designtorget gadget and design shop. You’re now finished with this section of the city. Cross Västra Hamngatan and keep going until you reach Magasinsgatan. Take a peak inside Artilleriet furniture and interior shop which was chocker but has a magical feel thanks to all the Christmas décor. Try Strömmingsluckan for tasty and local fast food. They’re famous for their fried herrings and mashed potatoes with lingon berries. Enter da Matteo Torrefazione (the bigger of the two cafes on the left) and walk through all the way to a small staircase at the back. Here you’ll find a small backyard with the beautiful flower and interior shop Floramor & Krukatös. This was gorgeous at Christmas and I imagine it would be lovely in the summer too. Turn left along Ekelundsgatan. When you reach the roundabout, turn right for Feskekörka Fish Market Hall with its many fish dealers, café and restaurants. Again, look out for the tasty samples on offer! 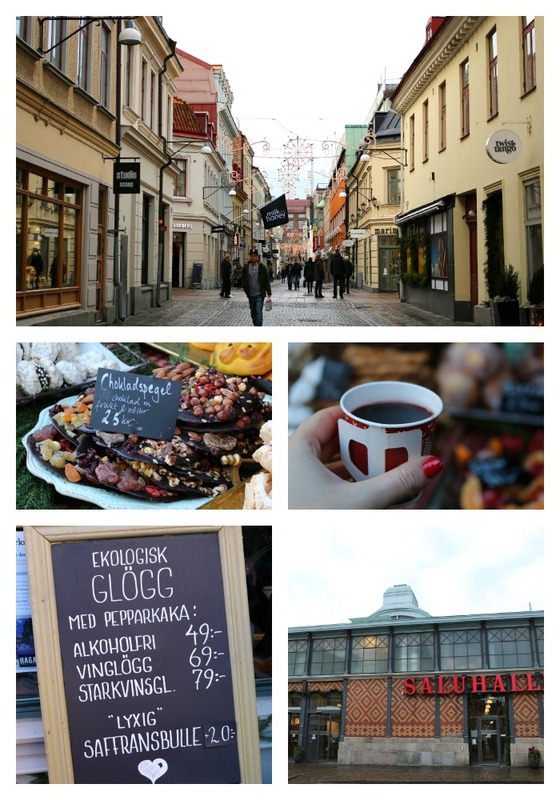 The streets were crowded while we were here with a traditional Christmas market so we had plenty of opportunities to stop and sample the glogg – Swedish mulled wine (don’t worry, the alcohol content appeared to be next to nothing). And that’s the end of your shopping walking tour in Gothenburg! It won’t take long to walk back to the Central Station but if you’re feeling too tired – or have too many bags to carry! – take tram number 3 from Järntorget square eastbound to stop Valand on Avenyn. You can then change to tram no 3 Kålltorp or no 7 Bergsjön back to the Central Station/Drottningtorget. Did you notice the shiny new ‘Print it’ button at the top? Click the button if you’d like to print this without images to create an easy to guide to follow while you’re in Gothenburg. It’s worth picking up a map from your hotel reception desk too but Gothenburg is so small it would be difficult to get lost. Enjoy! 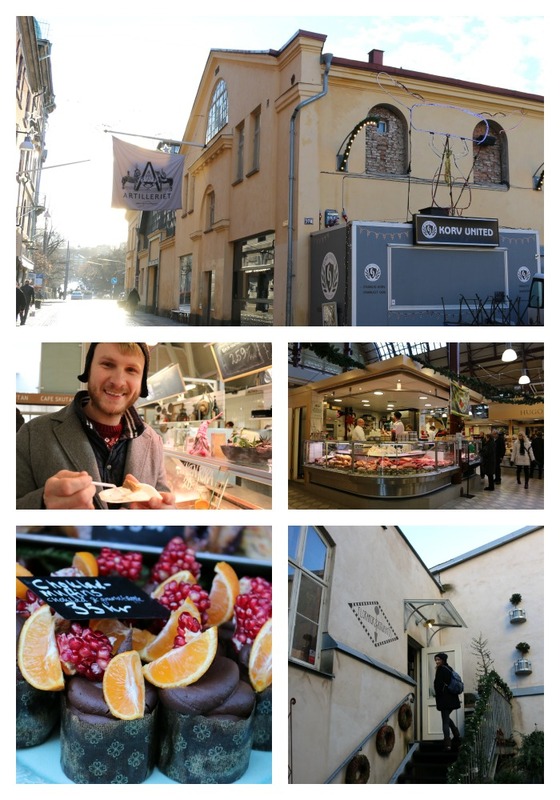 You can check out more of my blog posts from Gothenburg here. We loved it, it’s a gorgeous city. If you can, I’d hold out until next Christmas. I think the Christmas markets made it even more special. Oh, the names are horribly hard to remember but it still looks like a gorgeous place to go! Beautiful pictures too! They really are, I still have no idea how to pronounce half of them. Those pants hanging are super cute! And I love that the town is small enough and big enough that you can describe all these awesome shops! That was one of my favourite things about it too. It was perfect for a weekend break as I felt like we’d covered everything but didn’t get bored. Imagine going to New York City for a weekend and trying to see all the shops! So excited I found your blog!! It is wonderful! We are planning a trip to Gothenburg in the Winter. I had never even heard of it before today! How helpful your post are! Off to read more….and to look for that printer-friendly button! 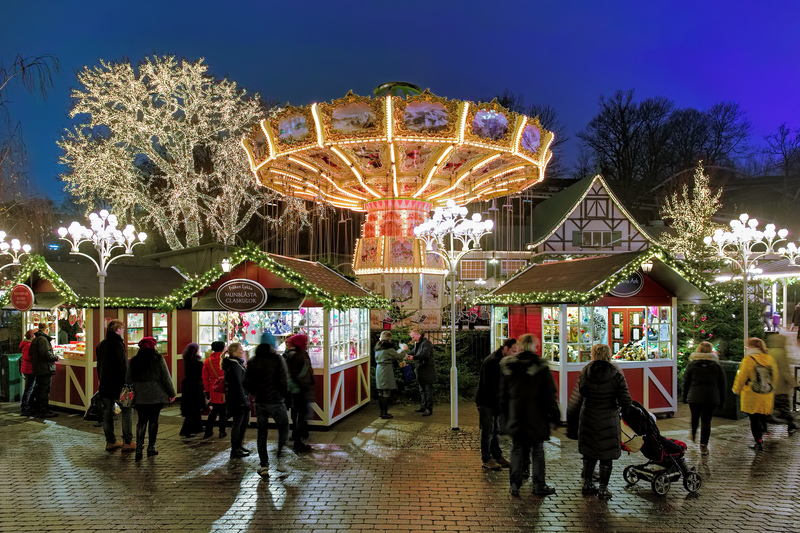 Liseberg Christmas Market in Gothenburg: The Best Christmas Market in the World?